Targeted nutrients and herbs that support healthy thyroid function and facilitate the expression of thyroid hormone genes. ThyroMedica Plus is a capsule with Albion Minerals that features targeted nutrients and herbs that support healthy thyroid function and facilitates the expression of thyroid hormone genes. This formula includes the key ingredient of L-Tyrosine, which serves as the foundation to nourishing healthy levels of thyroxine. Ingredients of L-Tyrosine and iodine also play a key role in the synthesis of thyroid hormones. Additionally, riboflavin, flavin adenine dinucleotide (FAD), serve to produce energy in the cell and facilitate the metabolic production of energy from food. Guggul and Ashwagandha help aid in the conversion of thyroxine to the more bioactive triiodothyronine (T4 to T3) and may help stimulate the thyroid gland. These ingredients have also been known to aid in maintaining healthy blood lipid levels. Rosemary has been added for its antioxidant propertied, which may prevent free radical damage to thyroid tissue. NuMedica is a leader of the nutritional supplement industry. The company's safe and effective products set the benchmark for their field and continue to be respected among a growing customer base that prefers to rely on natural and nutritional products to support optimum health. For almost 60 years, Albion has been the world's supplier of chelated minerals. Chelated basically translates to "firmly attached," and means that these minerals attach to other components like amino acids to the two do not dissolve in the digestive tract. L-Tyrosine is one of the Tyrosine group of amino acids that are the "building blocks of protein." The body creates tyrosine through another amino acid called phenylalanine, and can be found naturally in foods like meat, fish, eggs, nuts, beans, oats, and wheat. L-Tyrosine specifically is important to almost all protein structures in the body and its the precursor to neurotransmitters like L-dopa, dopamine, norepinephrine, and epinephrine. Other Ingredients: HPMC (vegetable capsules), MCC (microcrystalline cellulose), rice flour, ascorbyl palmitate, silica. TRAACS is a registered trademark of Albion International, Inc. Malates covered by Albion International, Inc., U.S. Patent 6,706,904 and patents pending. WARNING: Excess vitamin A intake may be toxic and may increase the risk of birth defects. Pregnant women and women who may become pregnant should not exceed 5,000 IU of preformed vitamin A (retinyl acetate or retinyl palmitate) per day. 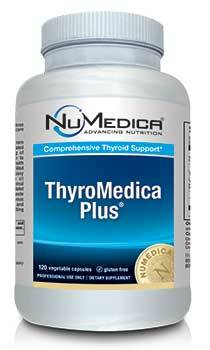 Supports healthy thyroid function, potentially improving weight management, energy levels, and overall organ health. A liquid organic iodine supplement that promotes growth, stimulates the metabolic rate, and aids in burning excess fat.